1. Determine the strength (capacity and stability) of the oil and water binding effect from Rice Bran Extract (RBE) with qualitative and visual documentation using an outside third party lab. 2. Compare findings with other ingredients in the marketplace. 1. Compare the data from the lab vs. other types ingredients (egg and mono & diglycerides). a. Combinations of ingredients along with water and oil were prepared. 2 ml of ingredient blends were added to 20 ml of water and shaken. (1) Data was interpolated from HLB data and estimated based on the HLB by water solubility. 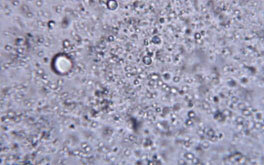 (2) Capacity Test – Aqueous solution was shaken and evaluated (not centrifuged). Absorption was measured at 420 nm. (3) Stability Test – Aqueous solution was left to stand for several hours (not centrifuged). Absorption was measured at 420 nm. 3. The following photos taken by the third party lab give a visual reference to the comparisons of RBE to soy lecithin. 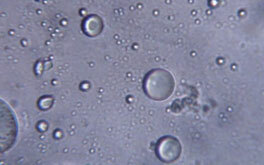 The smaller the oil droplets, indicates a higher capacity to bind oil and water, as verified by the numeric values. There are a number of ingredients that bind oil with water. These range from natural / organic ingredients (egg and RBE) to synthetic modified emulsifiers (mono & diglycerides). Some of these ingredients are hypoallergenic (RBE) while others require US – FDA allergen labeling (egg and soy lecithin). 1. The natural binders (egg and RBE) had the highest capacity of oil in water binding. 2. 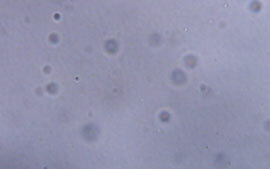 The RBE showed more uniform dispersion of the oil droplets, than did the soy lecithin or oil and water alone. 3. Producers today have options for clean-label, natural / organic binders of oil in water.